Last week I gave tips on cleaning and organizing your pantry. I discussed that if you really want to commit to decreasing decision fatigue and staying on your diet, clean out the pantry and replace bad items with good ones. 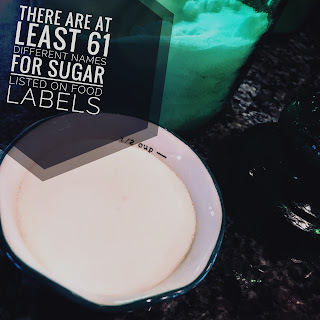 In order to know the bad you really have to identify what is considered sugar and at over 60 names for the hidden monstrosity you could go nuts. Most people think that sugar is mainly found in desserts, cookies, pies, and cakes, but it's also found in many savory foods, such as bread and pasta sauce. 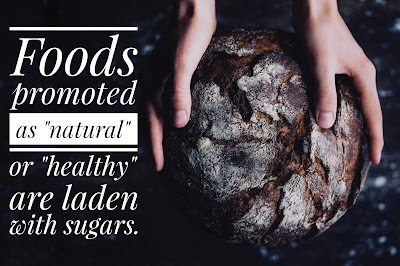 Foods promoted as "natural" or "healthy" are laden with sugars. Just because it's gluten free doesn't mean it's healthy. Food manufactures fool the general public by take out fat from food, which ironically your body needs certain fats, and replace them with sugar or the cheaper alternative high frutose corn syrup. In fact, 74% of packaged foods sold in supermarkets has added sugar. So, even if you skip dessert, you are consuming sugar, and most likely more than your body can handle. There are at least 61 different names for sugar listed on food labels. These include common names, such as sucrose and high-fructose corn syrup, as well as barley malt, dextrose, maltose and rice syrup, among others.